The Epson DC-21 will be available to classrooms in February. 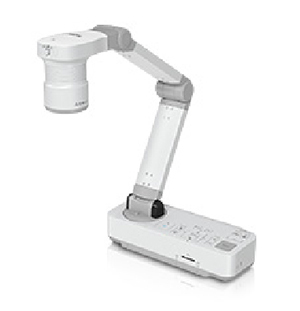 Epson has introduced a document camera with a microscope adapter that allows it to create magnified laboratory images and enhanced HD resolution. The DC-21 document camera is equipped with HD 1080p resolution and provides close-up detail with 12x optical zoom and 10x digital zoom. It also has a built-in microphone so that it can record audio along with video, meaning it can be used to create video lessons for remote classrooms or flipped classroom situations. According to the company, a larger than usual imaging sensor captures more light per pixel to deliver brighter images with higher quality. The DC-21 camera can rotate 90 degrees both vertically and horizontally so that it can be used as a webcam to capture classroom activities and for videoconferencing. With a large capture area, it can easily display two full pages of a document. And its split-screen function allows users to display live and/or captured images side by side, making it possible for classroom demonstrations where before and after photos may be required. The DC-21 has auto-select resolution, which means it can automatically detect the native aspect ratio of connected projectors and select the correct output resolution. "The DC-21 document camera provides advanced features to allow educators to take lessons further with astounding clarity and color," said Epson America Projectors Product Manager Veronika Knight. "Whether sharing a book, 3D object, experiment or magnified image, the DC21 offers bright images and flexible teaching tools for a more interactive learning experience." The Epson DC-21 will be available in February with a suggested retail price of $549. It comes with a two-year limited warranty that includes direct phone support service and a one-day replacement program. For more information, go to the Epson site.